Over the last eighteen months, my fellow Labour councillors and I have introduced 100 Source London electric vehicle (EV) charging points in Hammersmith & Fulham. That is the most in the country and many times more than any other council. We aim to have 250 by the end of the year. We’ve also introduced the Bluecity electric car club and negotiated a deal that allows our residents to try the club for free. The electricity provided by Source London and used by Bluecity is SSE Green which is 100% clean, coming with a zero emission rating - mostly generated from wind and hydro-electric sources. Driving one of the Bluecity EV cars has the pleasant effect of putting a smile on your face but that isn’t our primary motivation. We believe we need to make a determined push to clean our air. Air pollution is linked to chronic lung problems, asthma, heart conditions, breast cancer, dementia and even diabetes. London’s air is the most dirty in the country. The south side of the Hammersmith Broadway gyratory is the fifth worst polluted black-spot in the country. Our borough has 4 of the UK’s other locations for Britain's worst polluted air. Back in 2015 we set up one of London's first Air Quality Commissions which undertook an extensive public inquiry producing this report last year. We have also been taking a number of actions to improve air quality since local residents gave us control of the borough in 2014. Those include introducing new safe cycle routes, planting plants that absorb pollutants, deterring lorries and rat-running cars from entering residential areas and lobbying the government and London’s Mayor to replace the Hammersmith Flyover with a flyunder. 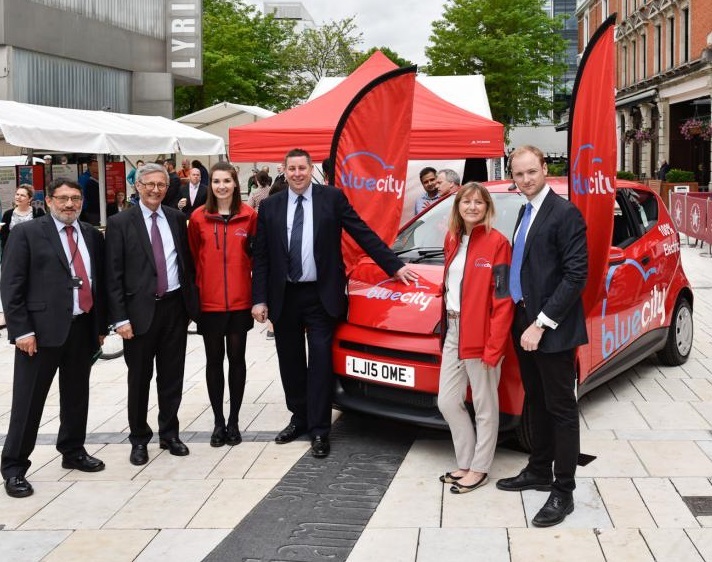 But, the Source London network and the Bluecity car club has the potential to make a generational shift and change how all of us live and travel as EVs and the EV car club catches on in London and other parts of the country. We aim to increase the number of EV charging points and to keep building the network and encouraging demand to increase. The scheme is run by the Bolloré Group, a French company, who have invested £3 million into our borough. Their electric cars are made in the European Union bringing new jobs and economic growth with this new life style choice. I say new… Actually electric cars were popular from the 1880s until the early twentieth century. But as the internal combustion engine was refined and gasoline became cheap and plentiful they lost out and the twentieth century took a different path. It’s not hard to see how different modern history might have been without our reliance on oil. So how should we plot the course for the next 140 years? What will future generations say about us if we don’t urgently clean our air and find new ways of getting around and living in a way that sustains our environment? We have to act and in Hammersmith & Fulham, I am determined H&F Labour remain in the vanguard in doing so.